There’s no way to note this without appearing just the tiniest bit morbid, so I’ll come right out and say it: One day, I will be dead. Indeed, if you are reading this in the future (and one day, you may just be!) I may already be dead. In which case: Uh, hello, future. I hope you’re enjoying your personal rocket packs, which I never got, you lucky bastards. But that’s okay, because so far, when I lived and where I lived was not bad for me in the slightest. In fact, for someone like me, it was (and to get back to the current time, is) a pretty good time to be alive. It has its problems. Right now the US is in a severe money crunch and something that we’re being told isn’t an actual depression but is about as close to one as anyone under the age of eighty has ever experienced. Class divisions are as stark as they have been in the history of our country. We’re in an extraordinarily partisan political environment that’s paralyzing our governments, federal and state, and we’re about to gear up for an election year that promises to rival the presidential elections of the early 1800s in terms of sheer nastiness. And then there’s the rest of the world. Oy. It’s a mess. But it’s never not a mess. This is not to discount the problems we have now — please, let’s not — but it is a reminder that every time and every generation has its crises and its troubles. In my own lifetime of 42 years to date, troubles in the United States these have included the Vietnam War, Watergate, oil embargos, stagflation, recessions, the cold war, the rise of the national debt, climate change, 9/11, the Iraq and Afghanistan wars and banking crisis. That’s nothing compared to the 40 years before I was born, mind you. But it’s enough to make the point that whenever you live, one’s world and one’s nation will be beset by challenges. We’re humans. This is what we do. I note this to acknowledge the fact this time and place are not perfect. I do what I can to help it become what I see as more perfect, while knowing it’ll never get there in my lifetime or (judging from the history of the world) in the lifetimes of probably the next hundred generations to come. Perfection is probably not the point for humans anyway; the working toward it is. It’s like the speed of light: something you’ll never reach no matter how much energy you put into it, but still worth getting as close to as possible because of the things you’ll learn by doing so. So: not a perfect time. But is it the right time for me? I think so. Part of this is entirely practical: this is the time of three “A”s: Air conditioning, antibiotics and anesthesia, all of which make life longer and more pleasant. It’s also the time when I walk around with a computer that fits into the palm of my hand that lets me access information from the entire span of human history, more books, music and moving entertainment that I could read, listen and see if I had seven more lifetimes, and which allows me to communicate, instantly and cheaply, with friends on the other side of the planet almost as easily as if they were in the room with me. I live in a time where I can make a living, sitting in a room in my house, typing. Part of it is personal: I like the people I know now. Living in any other time and any other place would mean different people in my life. I don’t doubt that I would be able to find good people with whom to live my life — but it wouldn’t be these people, and my life would be different, and to a non-trivial extent, I would therefore be different as well. I’m grateful that living now has led me to my wife, and has resulted in my child, both of whom I cannot imagine my life being improved without, no matter who else could theoretically replace their roles. I can’t imagine wanting to be without the other people that I love, who live here and now. These are the right people for me. They exist now and only now, here and only here. I won’t live forever. I will die one day, and there will be many things many people will experience — both good and bad — which I never will. That’s the deal. It is biologically speaking the reason you have kids, so that part of you goes on even if you don’t. Socially speaking, it’s why you make an effort to raise your children to be intelligent and active people, engaged in the world, so that their world, for the time they are in it, is one they are happy to be in. It’s why we as humans continue to try to make the world better, so that humans, whether specifically our children or not, will continue on. By the activity in our own lives, we implicitly accept that we will not last. I will not last. But right now I am here, and I am thankful that I get to be here, now. To you people of the future, who might read this after I’m gone, I envy you the things that you get to see and do that I will not, the people you will know and the places that you will go, both here and — who knows? I am a science fiction writer — elsewhere. But know this: By not being here where I am, when I am, you missed out on a lot, too. These were and are exciting times to live through, with some of the best people you could hope to meet. I wish you could have known them, the times and the people, as I do. I am sorry that you will not. But I hope that in your time, in your place and with the people you know and hopefully love, that you are as thankful for them I am with mine. If you are, then that is something we can share, no matter what else separates us. I hope you feel it. Happy Thanksgiving, now and then. I like the essay; though, personally, I’m going to live effectively forever. Hey it’s a possibility (thouh low probability). I mean a decade ago we were told nothing could go faster than light; maybe even death is a theory that is over-generalized. Happy Thanksgiving to you and your family, John. Thank you for sharing your advent calendar with us. It has been both fun and thought-provoking. Happy Thanksgiving to all my fellow American Whatever followers as well. Enjoy whatever you do to celebrate. I am thankful that I have M. Scalzi to write these words so that I don’t have to. Without him, my life would be different. Leading by example makes for such a wonderful leader. Every day that I’m above ground rather than under it is a day I’m thankful for. Good essay, John. My 7th, 8th, and 9th Facebook-serialized novels are the Alzheimer’s War trilogy, primarily about Immortality, set in the year 2020, with 100 pages of citations to current literature (biomedical, physics, chem, astronomy) after about 1,400 pages of story. So my writing and my thoughts against Death go together. As to “Right Here, Right Now” literally, remember that Minkowski first understood, and Einstein popularized that, the Present in a point, where the Absolute Past and Absolute Future touch, and all is surrounded by Absolute Other, outside the light cone, which cannot influence us, and we cannot influence it. Great sentiments. Thanks for writing this. Well said. Thank you, and enjoy Thanksgiving Day. I tweeted about this exact thing a few days ago. Got a mental grip on the real meaning of being dead forever for just about a minute. Made me wonder if some of the people who really live joyously and “as if every day could be your last” have that grasp all the time. Lovely words. They make me feel slightly less bad today. As the Talmud says, roughly, it’s not your job to finish the job of fixing the world, but that doesn’t excuse you from doing all you can to make it a better place. Beautiful, thank you for sharing. Happy Thanksgiving to you and your family. I have a slight quibble with the sentiment you (Scalzi) expressed (as a rough paraphrase) that, once you’re dead, you’re gone for good. I am not a religious person. I do not believe in a “supreme being”. However, I think it’s naive to assume that, just because the physical shell is dead, the essence of a person–their “soul”, if it must be expressed as such–cannot live on. Much of our environment today was considered “science fiction” a century ago, so who’s to say that we *don’t* live forever? I liked ST: DS9’s take on it, where in the Trill race, the physical body *was* just the shell, the “parasite” living inside the humanoid body was the “real” sentient being. No belief in “god” required, just the belief that, unless/until the “parasite” died (I forget if the Trill mythos posited immortality or not), as long as they had a new host to inhabit, they were still “alive” as we understand it. While it was happening, I watched the screen. The heart is full of flippy-flappy things. it makes squishing swooshing and lupping noises. red and blue colours move thru it. all in all, its a terrifying organ. I kept thinking that the only thing between life and death is that flappy thing in my chest. Here’s to keeping that flapping going as long as life is golden. I used to want to live forever. Then after 9/11 I realized that my late father was spared that horror. I don’t know what kind of unholy stupidity the future holds but at least I won’t see it all. This is the best of all possible times in human history to live. I firmly believe that, but I’ve never seen it expressed so eloquently. I guess I see mortality like this. Suppose that, upon death, I were reincarnated in another infant body, with no memories of my previous life. Somehow, that scenario for me sidesteps the horror of personal nonexistence–and yet it has really no subjective or objective difference from a world in which I just go away and somebody else is born. That suggests that, while wanting to live obviously makes biological sense, worrying too much about the horror of not existing is somehow in error, as long as we’re capable of empathy with other people. Somebody else’s consciousness is in some sense as good as mine. I suspect that the notion of a unitary self that is constant through time is something of an illusion induced by memory; I’m not the same person I was ten years ago, maybe not the same person I was yesterday. I find it kinda depressing that the rest of the world is looking to us for leadership, ’cause frankly I’d prefer to look somewhere else myself. On the other hand I guess I can be grateful I don’t live in… I dunno. Greece? I’ll grab a map, throw a dart and get back to ya. Happy Thanksgiving to you and yours, John, and to those reading and commenting here. I am glad you’re all here. Personally, I’d just as soon move on at some point and make room for my grandchildren. Or their children or grandchildren. Or someone else’s grandchildren. I am writing this comment from the future. 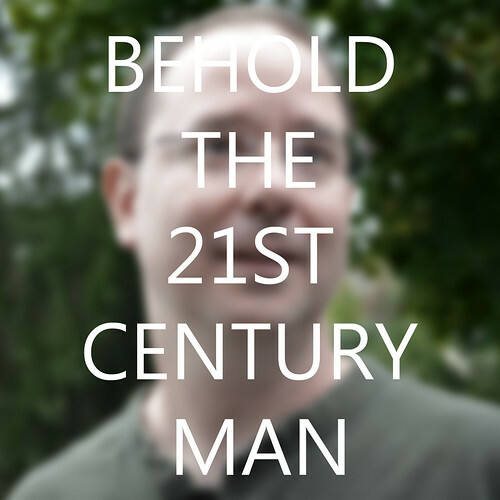 Mr. Scalzi, you’re still around in the year 2133 enjoying an aluminium alloyed with titanium body. I love this. Good reminders of several things. Y’know, if you get one of those fancy new rocket backpacks at age fifty, and take it out for a spin, and auger directly into the dirt and die, that first paragraph is going to look kind of stupid to the people who have to go through your writings later. Indeed, if you are reading this in the future (and one day, you may just be!) I may already be dead. In which case: Uh, hello, future. I hope you’re enjoying your personal rocket packs, which I never got, you lucky bastards. I am reading this from the future. About half a day into the future to be precise. Greetings, man of the past. Bad news: we don’t have personal rocket packs. Good news: you aren’t dead. Wish we had Thanksgiving in the UK (rather than, say, Royal Weddings but that’s another post…) though I guess you don’t need a formal holiday to take a step back and consider these things once in a while. happy thanksgiving from the future! the jetpacks really are nice. The rest of us, belike. I came up with about 7 jokes, but all of them risk engaging the failure mode of clever. It was just me, my wife, our son, and our dog for the dinner that my wife spent hours preparing. Not quite the same as my childhood holiday dinners with two great-grandparents, 4 grandparents, both parents, and dozens of aunts uncles, and cousins — yet still infinitely precious.